The Florida Everglades is a one-of-a-kind environment. But, this is largely due to the fact that Florida is the only state in the continental United States closest to the Tropics. This location makes us both the envy of people living in the blizzard-prone, northern states as well as a coveted winter vacation destination by them. It’s easy to see why: Florida’s sub-tropical climate lets both residents and visitors alike relax along its many beaches or enjoy the excitement of airboat rides year-round. But the Florida Everglades doesn’t really have four seasons. Sounds strange, right? We can explain. You may recall from science class that the tilt of the earth and its rotation around the sun change the amount of sunlight and heat we get throughout the year, giving us four seasons: spring, summer, autumn, and winter. As we mentioned earlier, Florida’s location being closer to the equator means that it stays warmer on average than other states. Because of Florida being in this fortunate position, the Everglades experiences only two seasons a year. If you are guessing which ones they are, no, the two seasons are not spring and summer, or even spring and autumn. In fact, differences in sunshine and temperature are not the biggest overall signs of changing seasons in the Everglades. Changes in water levels during the year are what determine which season that the Everglades is currently in. 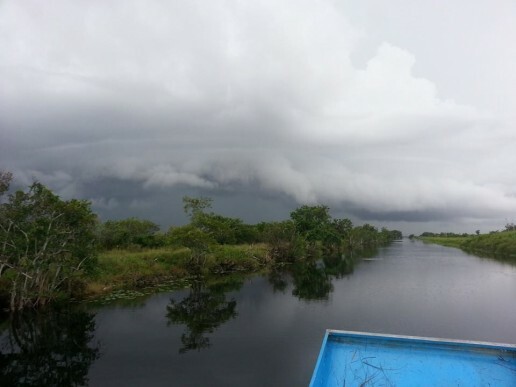 From the middle of May through November, the Everglades experiences heavy rainfall, known as the wet season. Moving into December on through April, there is little to almost no rain, which is known as the dry season. While these two very different seasons sound extreme, the Everglades wildlife treats it like we would a calendar. The dry season is the peak of bird activity in the Everglades. Migratory birds wait out the cold, northern winds and eventually chase them back home as the temperature rises. The native Florida wading birds use the low water levels to make nests, making dry season and their hatching season one in the same. 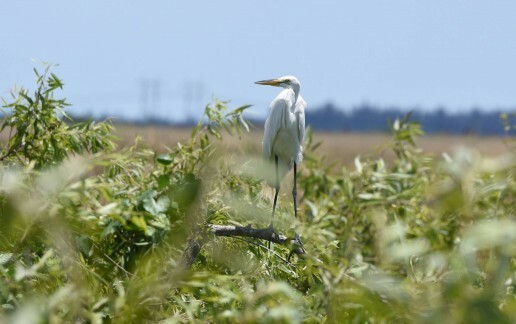 During the wet season, the alligators, turtles, and frogs nest and hatch, as the wading birds teach their young to hunt. The incredible biodiversity of the Florida Everglades allows you see it thriving at any time of year. With that said, what would you want to see there? You can plan your journey to Mack’s Fish Camp by clicking here. The last two animals mentioned are significant, as both play vital roles in the health of the Everglades’ ecology. 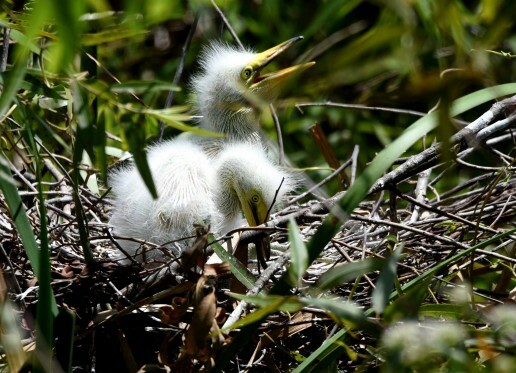 Wood storks are one such creature threatened by changes to the Everglades. They are considered to be the “Goldilocks” species of wading birds, because their nesting habits show the health of the Everglades. 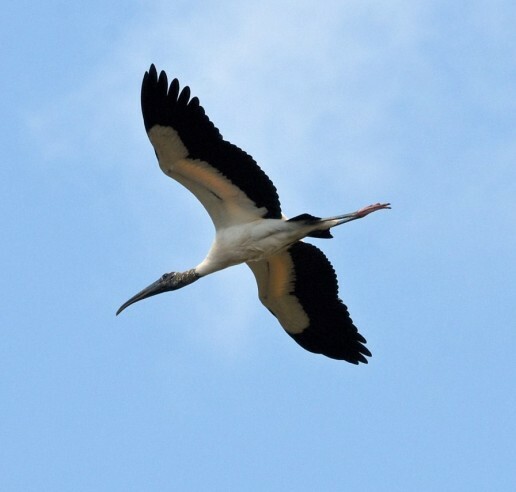 Wood storks nest during the dry season when water levels are lower, and then feed and train their young as the water and fish population rises. If the rain season brings too much water, it’s harder for them to find fish to eat. An extended Everglades dry weather season makes their prey scarce. Even the mighty American alligator has seen its numbers decrease, mostly due to human population growth and a demand for their meat and skin. Since being removed from the endangered species list in 1987, their numbers have been improved through farming. Unlike wood storks, alligators play a more direct role in maintaining the environmental health of the Everglades, by making small ponds called alligator holes. Alligators clear old vegetation when making these holes, which promotes new growth. And once an alligator moves out of one, it can act as a refuge for fish, turtles, birds, and other small animals during the dry season. Even though they have bounced back, they are still listed as “Federally Threatened” due to their similarity of appearance to the American crocodile. 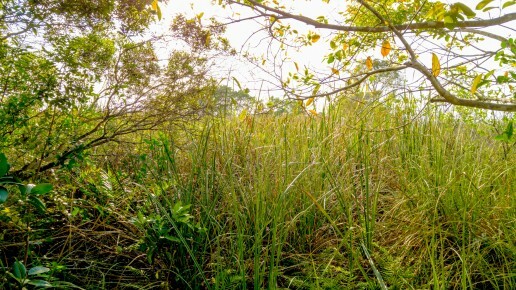 The Florida Everglades is a truly unique place, one that sustains and is sustained by the wide variety of the plants and animals that live here. At Mack’s Fish Camp, appreciation and awareness of the relationship between the many birds, fish, alligators, and the River of Grass is a cornerstone of Gladesmen Culture, and one we’re grateful to share with you. If you’re interested in experiencing the unique beauty of this environment firsthand on one of our Everglades eco tours, please click here. During your daily commute, you might spy a glance at a stretch of wilderness that seems unexplored when compared to your all-to-familiar routes to and from work. Getting settled into a traffic bottleneck, you recall that patch of wild earth you saw. You wonder not so much about what exploring it would reveal, only how glad you would be to be there at that very moment. Sure, you may get a break at work, but what you’re after is a real escape from the maze of city living. The burnout of so much focus can make us irritable and impatient, but spending time outdoors can give your brain a much-needed break. Being in nature puts the brain in a type of cruise control called soft fascination, where you’re relaxed and your mind is focused effortlessly. Spending time outdoors, away from the routines of urban living, can inspire you to explore. If the saying “familiarity breeds contempt” rings true for you, that could be reason enough to break out of the urban sprawl. Taking a canoe trip through the Florida Everglades is a great way to see different varieties of wildlife and immerse yourself in its vast landscape. Or if that’s not your speed, a private airboat tour across the alligator holes and sawgrass is the thrilling reunion with the outdoors you need. With the hectic pace that modern life is set to, sunrises and sunsets can end up just being bookends to a day. When you visit Mack’s Fish Camp, that stubborn urgency is replaced with a sense of timelessness. Having nature so close to the residential areas of South Florida, the simplicity and stillness of the Everglades can easily be overlooked. If you take the time to see it up close, you’ll discover another world hiding in plain sight. Getting Outdoors Is Good For Your Health. Here's Why! At some point, you’ve heard a co-worker say that you or they “need to get some fresh air,” which can mean jogging through busy intersections for a cup of coffee. Or maybe on a nice day it hits you that the only time you spend under the sun is walking through parking lots. Moments like these are not-so-subtle hints that you’re in need of some quality time outdoors, if only for your health, and a trip to Mack’s Fish Camp could be just what the doctor ordered. Spending some time in the Everglades could be easy on the eyes in more ways than one. Artificial light can provoke nearsightedness, especially in children. But, plenty of time spent in bright outdoor light helps our eyes to maintain the ability to focus our vision at greater distances. Also, sunlight is our best source of Vitamin D, which is essential to maintaining a strong immune system. After being treated to a vivid sunset, you’ll soon find yourself under a blanket of stars. Along with the South Florida sunshine to soak up in the Everglades, you’ll be far removed from artificial light. We tend to spend much of our waking hours bathed in the light of computer displays, TV’s and smartphones. This constant exposure messes with our circadian rhythm, which regulates our sleep habits. Spending just a weekend outdoors can reset your circadian rhythm and potentially provide you with better rest after your Everglades adventure. The one health benefit of being outdoors that can’t be overstated is stress reduction. People see having stress as much a given part of their day as a lunch break. But just as easily, spending time in nature can lower your heart rate and blood pressure as well as stress hormones. While laughter may traditionally be the best medicine, nature is a very close second. We often place so much value on endless movement that we forget how to slow down. When you visit Mack’s Fish Camp, you’re free to set your own pace. Whether it’s paddling a canoe or taking an airboat ride searching for largemouth bass or just an incredible view. So, if you’re overdue for some time outside, we can remedy that. 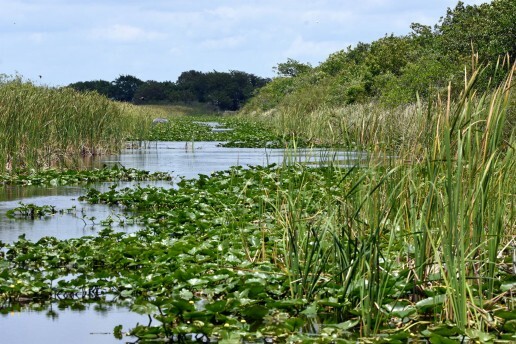 Why Take an Everglades Airboat Tour? The Florida Everglades is a sprawling landscape, full of natural beauty. It’s so massive that it could prove a challenge to anyone trying to see all of it by just canoeing or camping. Everglades airboat tours at Mack’s Fish Camp can provide a more direct experience with what the River of Grass has to offer you. Being one of the most biologically rich habitats in the world, the Everglades are home to a wide variety, especially animal and plant life. There are many different bird species to be seen, especially wading bird. 16 different species of wading birds live in the Everglades, mainly those of ibis, egret, and heron. Birds of prey are also a common sight as well. 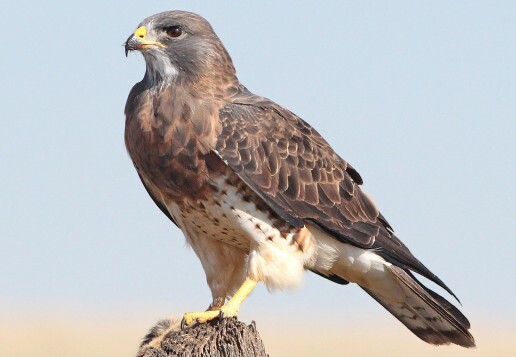 Raptors such as osprey and red-shouldered hawks can often be seen hunting lizards, snakes, rodents, and even fish during the day, with the more nocturnal barred owls appearing in the early evening. While there have been over 350 birds sighted in the Everglades, nearly 200 of them are migratory. Meadow larks, cardinals, red-bellied woodpeckers, and blue jays can be seen during the drier winter months before the rain season. But, the most well-known creature out of all South Florida wildlife (No, not the Skunk Ape!) would have to be the American alligator. 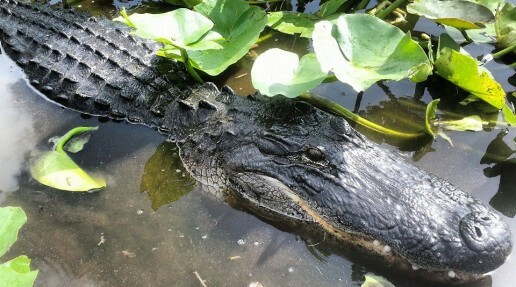 Even without the close-up views provided by Everglades airboat tours, alligators are a standout due to their size. Adult females can reach 10 feet in length, and males can max out at 13 to 15 feet. Alligators are considered a keystone species of the Everglades ecosystem. The “gator holes” that they make in the marsh as a sort of nest, help remove old vegetation and enrich the soil for new growth. 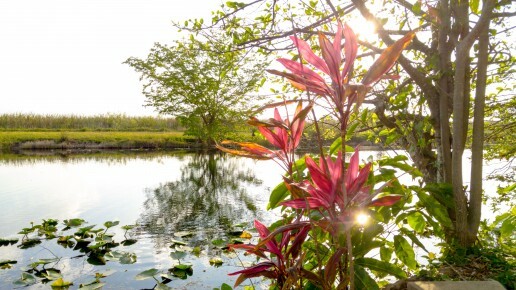 They can also serve as an oasis for other Everglades during the dry season, between November and April. An airboat ride in the Florida Everglades doesn’t have to strictly be for nature lovers. 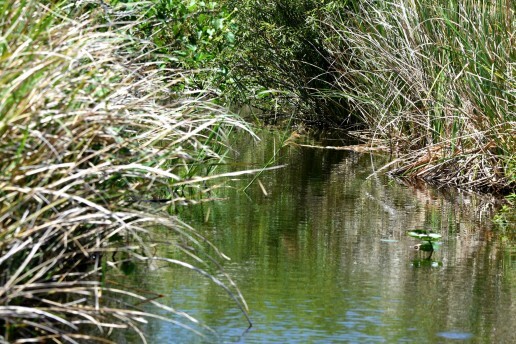 Being one of the world’s largest wetlands areas, South Florida is a great spot for fishing for largemouth bass. Apart from having Florida Gladesmen as your bass guide, the airboat ride itself provides a distinct advantage. 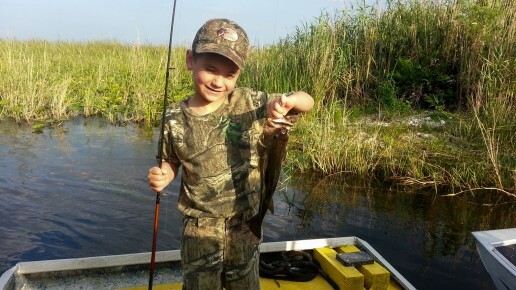 Because airboats don’t have prop or trolling motors, they don’t disturb the fish nearly as much! 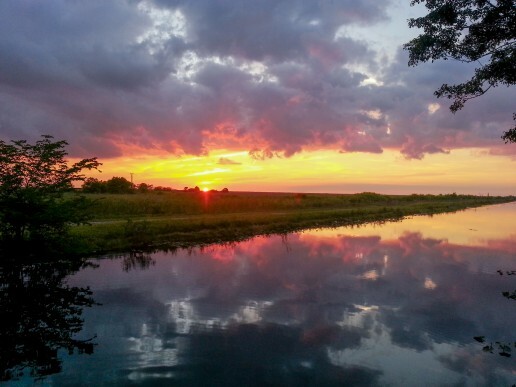 And let’s not forget about one of, if not THE best reason to see the Everglades by airboat, the amazing sunsets. With South Florida having no mountains, hills, or any topography, and the Everglades having no significantly dense trees or forestry, you’re treated to quite a panoramic view. The expansive sky is often the perfect stage for colorful, picturesque sunsets. 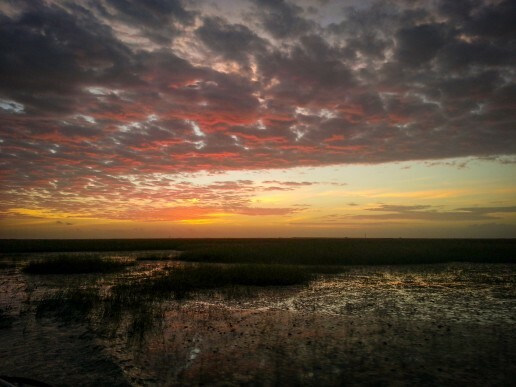 During the Everglades wet season, May to November, late afternoon storm clouds help “scatter” sunlight when dusk comes around, helping to fill the sky with more golden oranges and fiery pinks and reds. 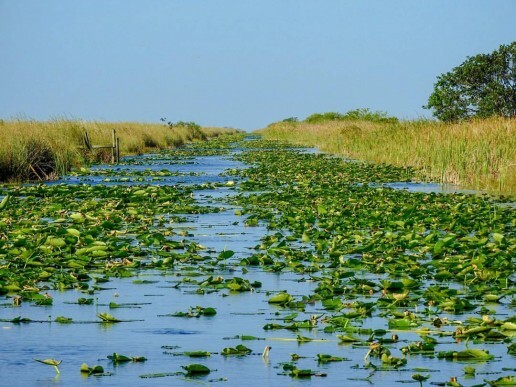 So, when you decide that you’re ready to visit the Everglades, whether it’s for the wildlife, the fishing, or the scenery, you can’t do much better than taking it all in on an Everglades airboat tour. 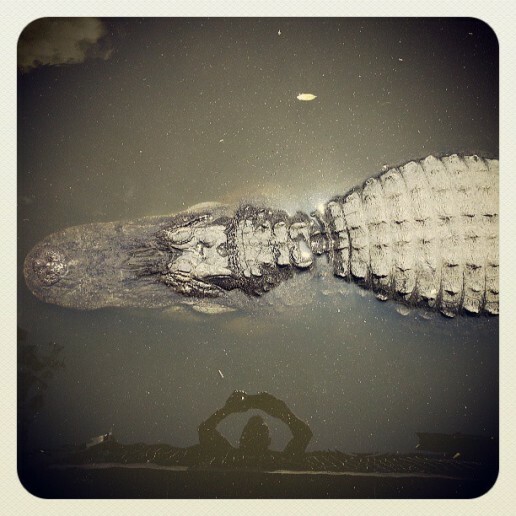 Never Seen an Alligator Up Close? It’s Time You Have! 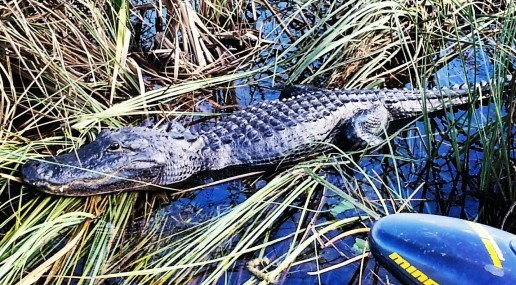 While riding on an airboat through the Everglades, you might swear you had just passed a log floating conspicuously out of place among the sawgrass and swamp lilies. A second look will show you that it was definitely not a log. 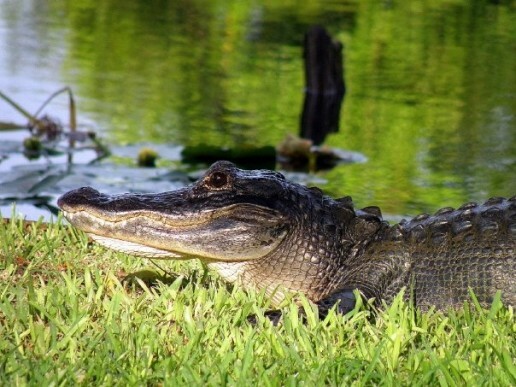 The American alligator has long been a fixture of the Florida Everglades, and one that you’ll have the opportunity to see up close on private airboat tour at Mack’s Fish Camp. Alligators usually stay in groups called congregations, and these groups can be seen swimming or basking in the sun. They do this to regulate their body temperature, because they can’t do it themselves. Alligators are carnivorous, but they don’t chew their food. They swallow their prey whole, relying on their sharp teeth and strong jaws to seize prey. Those sharp teeth of theirs are actually hollow and often break. But, they can just grow new ones! Given their size and toughness, you would think it’s a given that alligators are the apex predators of the Everglades, but they’re not. That title now belongs to the invasive Burmese python. 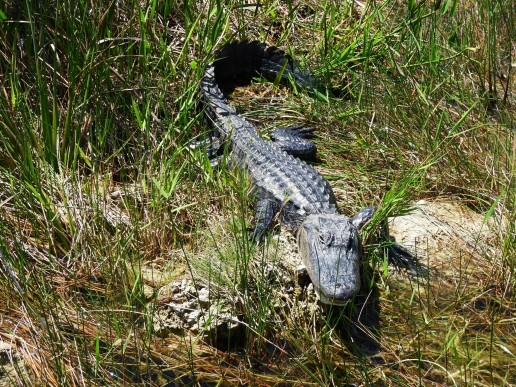 However, alligators are a keystone species, playing a critical role in the ecosystem of the Everglades. They make watery burrows called “alligator holes” in the muck and limestone bedrock. They do this to keep cool and attract prey, but these holes retain water collected through the rainy season (May to November), which retain rainwater and act as a refuge and oasis for other wildlife during the dry season (October to April). Alligators certainly are impressive creatures to behold, and you should always keep your personal safety in mind should you encounter one. Don’t ever feed them, because doing so can make them aggressive and worse, associate people with food. If you do happen to find yourself near an alligator, make sure that you’re at a safe distance (between 20 and 30 feet) from it, and back away slowly if you suddenly find yourself closer than that to one. While there is plenty of unique wildlife to been seen in South Florida, the most fun and safest way to behold these animals is by taking a private airboat tour. The most priceless souvenirs you can get in Florida are the memories of an airboat ride through the Everglades.